The Value of Tinkering – Ruth Catchen Reach for the Stars! Tinkering. It has been a while since I have thought about tinkering. As a child I loved to build things. My children loved to build things. We have Legos, trains, Kinex, building blocks, puzzles, and made things out of boxes and paper tubes. I remember having this multi-box castle held together with masking tape with doors and crawl space that we played with until it just fell apart beyond repair. Those things represent hours and hours of fun and imagination, and best of all, time well spent with my children. I have pondered how to incorporate more engineering skills into STEAM/STEM curriculum. Students have math and science, maybe some technology, and they use technology to research and to produce much of their school work. The question is where and when does the “E” in STEM have a chance? Churning out daily lessons in math and science labs doesn’t include much engineering. It seems to me that much of the engineering curriculum is used for gifted and talented kids or reserved for a special time or a fun day. 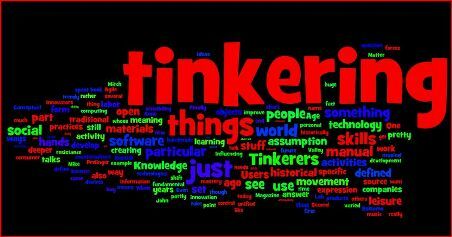 I wonder if there is value placed on figuring something out by tinkering? Experimenting? Build something and see if it works. Make a bridge out of sticks and see what it holds. Can a straw structure hold your favorite stuffed animal? In my humble opinion, engineering is for all learners. Everyone likes to build something or tinker. If students have this experience, who knows what they may discover. Students can take apart old toasters, VCRs, and other electrical appliances. By seeing how they are put together, students can learn how things are made and how they work. Our generation doesn’t fix anything. Instead, we just throw it out and get another. When I was growing up, my father didn’t do this. Not only did he not want to waste things, but also he found curiosity in trying to fix something. Tinkering is defined in the Merriam Webster dictionary as: to work in the manner of a tinker; especially : to repair, adjust, or work with something in an unskilled or experimental manner : to repair, adjust, or experiment with; fiddle as he is always tinkering with his car. Somehow the connotation of tinkering isn’t always positive; it’s as if someone doesn’t know what he or she is doing. Yet, this type of investigation is the road to discovery and innovation. Tinkering can lead to invention. Tinkering is brainstorming with your hands. Students can have learning centers within the classroom where the play, design, build and discover. 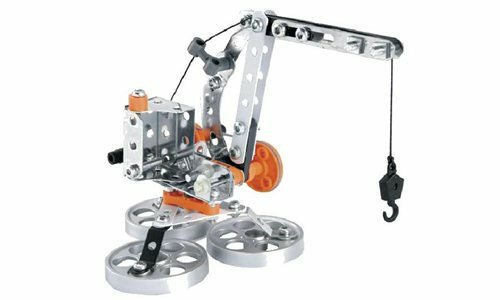 Using robotics is a popular form of incorporating technology and engineering. I like robotics and it is a good thing. Students can learn how things work, how they are built, deal with frustration and failure in addition to learning about electronics, computers, programming and mechanics. All good. Perhaps some of these skills, all valuable to life and a 21st century education, can be learned with out the expense of robotics, or in addition. Classrooms can become active learning studios in which students become active learners that always include hands-on creation. This kind of learning space supports all learning styles through building, dismantling, experimentation, trial and error, personal reflection and group collaboration. The teacher becomes the facilitator for all learning styles and needs through opened ended opportunity and discovery. Why doesn’t this type of learning happen more? Maybe we believe that learning must come from some predetermined structure or curriculum. Learning of this type can be messy and not appear structured or organized, so how do you measure learning is happening? Obviously demonstration of learning would fit the activity and it is easy to measure or observe. It may not fit into a mechanized rubric. Students will create and move forward. They can do research and expand their existing knowledge. Creativity is the norm rather than the exception. So take out those old electrical appliances. Bring on the Legos. Investigate. Let your hands and mind explore new ideas. Create an active learning environment.